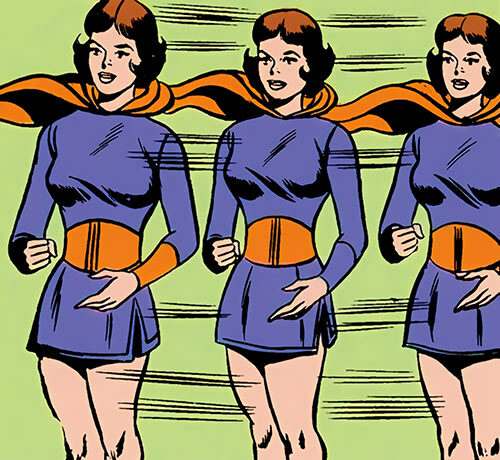 Triplicate Girl (aka Duo Damsel) is one of the early characters in DC Comics’ young-heroes-in-future-space Legion of Super-Heroes, which ran for decades. She appeared in 1961. 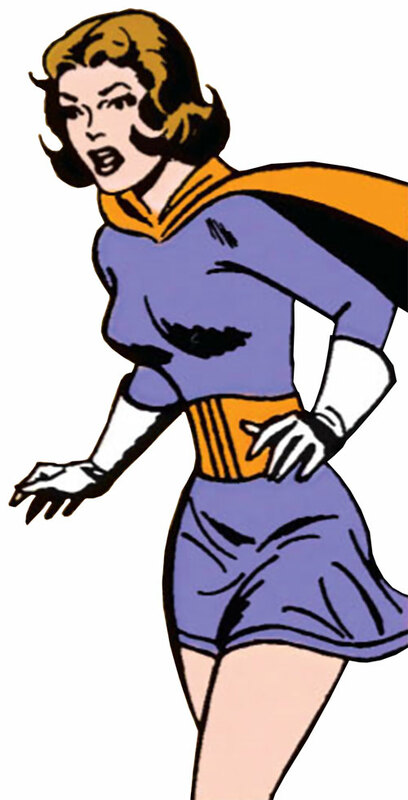 This profile focuses on her appearances during the 1960s – the bulk of the Silver Age of comics. Other Aliases: Triplicate Girl, Duo Damsel, Tina Glenn, Marie Elkins. Group Affiliation: Legion of Super-Heroes, frequent adjunct of the Legion Espionage Squad. Base Of Operations: LSH Clubhouse, Smallville, in Earth’s 30th century; Later the LSH HQ in Metropolis. Height: 5’7” Weight: 120 lbs. Luornu is from the plant Cargg. She had the typical Carggite ability to triplicate, materializing two exact copies of herself. This created 3 Luornus, each possessed of all the strength, knowledge, and skill of the original. One of her selves was killed by Computo. This left her power permanently reduced to the ability to duplicate, rather than triplicate. Post-Silver Age stories indicate that normal Carggites die completely when they lose one of their bodies, but Luornu somehow survived to become Duo Damsel. The ability to create a double or two may seem small beside teammates with shapechanging or super-strength. But Luornu is more formidable than is immediately obvious. She is quick-thinking, perceptive, and resourceful. She’s unusually strong for her size and build, perhaps as a result of her Carggite physiology. She’s a skilled fighter with training in hand to hand combat, fencing, and the use of firearms. She often spars with herself in training. Since each of her selves has identical skills and thought processes, they can coordinate with each other very well in combat (in DC Heroes terms, Fighting Array). Luornu is, for instance, the only Legionnaire to defeat Nemesis Kid in “single” combat. Luornu is frequently chosen to accompany the Legion Espionage Squad on missions. By duplicating herself, she is able to act as her own alibi. One of her selves distracting or occupying guards, for instance, while another self sneaks past. 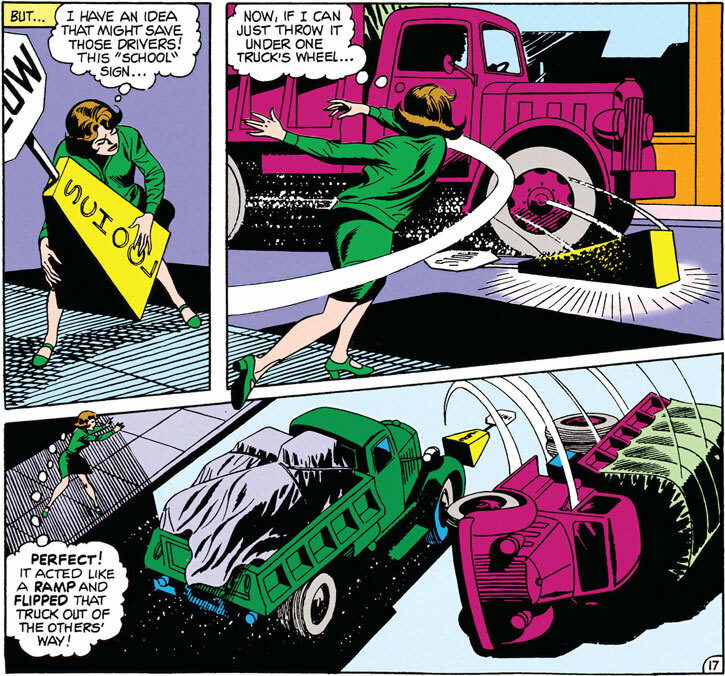 She’s shown some basic intrusion on these missions, including safecracking abilities, at least with the help of equipment provided by Brainiac 5. As a Legionnaire, Lu is able to fly through technological means. At first the LSH used jetpacks, but these were quickly replaced with anti-gravity Flying Belts. The rather bulky belts were later replaced by the early model Legion Flight Ring. Stats for these devices can be found in the Legion Equipment writeup. Luornu Durgo is from Cargg, a world in the United Planets with a triple sun. Cargg natives all possess the power to triplicate themselves. A romantic with an adventurous streak, Luornu was intrigued by newscasts of the founding of the Legion of Super-Heroes. She decided to see if her Carggite abilities would qualify for admission. 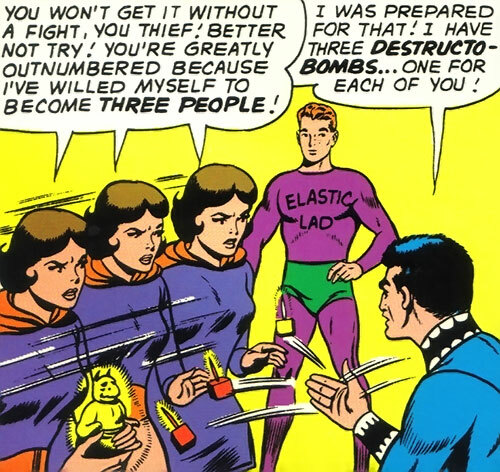 As the first ever applicant to the Legion, Luornu used her power to split into three girls and separately approached Cosmic Boy, Saturn Girl, and Lightning Lad. She asked each of them if she could try-out for membership, promising to reveal her power when they reached the Legion Clubhouse. The founders were surprised to see that each of them had brought the same applicant. They were impressed enough when they saw her merge to make her the fourth Legionnaire, using the codename Triplicate Girl. When it began, the Legion was as much a club for super-powered teenagers as it was a crime-fighting organization. (Secondary sources state that Luornu came to Earth specifically to apply to the Legion, but this is unclear from the primary source material. It is possible that she was already living on Earth at the time, given that her parents are later shown living on Earth in the suburbs of Metropolis. If the latter supposition is true, then as one of the few Carggites on Earth, Luornu may have sought out the Legion for the companionship of other non-native teens with non-standard powers). Luornu fit right in and quickly formed close friendships, especially with Phantom Girl, who joined immediately after Luornu. She also developed a powerful crush on Superboy. She knew who he was destined to marry and that she had no future with him, so she never acted overtly on this, but couldn’t help wishing that he would notice her. 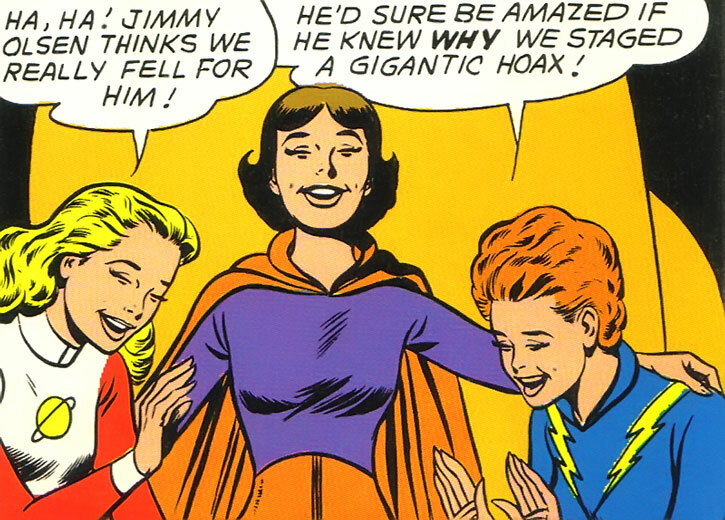 Luornu’s interest in Superboy may have influenced her interest in journalism. She became a staff reporter for the Legion Bulletin, a newsletter the Club put out in the early days. She also had a few time travel encounters with Jimmy Olsen and Lois Lane. During one of those she used the alias “Tina Glenn” and sought journalism tips from Lois while helping her with an emergency or two. Luornu was also active on missions. Though she was always one of the least powerful members, Luornu proved herself to be quick-thinking and resourceful. During a mission to evacuate refugees from the doomed planet Xenn, Triplicate Girl and other Legionnaires were stranded in space. It was Luornu who came up with the idea to attract and capture a passing “space roc” and use it for transportation. She was also one of the first Legionnaires to encounter the Time Trapper. While on a solo mission, the villain set a trap for her, intending to interrogate her about Legion secrets. Triplicate Girl managed to escape and warn the Legion about this new villain. On another mission, she and Matter-Eater Lad were able to sneak undetected onto the criminal world Khann and successfully capture its leader, the Brain-Lord Atro. They returned him to Earth to stand trial. Soon after that, Triplicate Girl and the other female members of the Legion went on a goodwill tour of several worlds, including the radical matriarchy of Femnaz. While there, they were subjected to powerful post-hypnotic commands by Queen Azura. Under her influence, the female Legionnaires returned to Earth filled with hatred for their male teammates. They plotted to capture and kill them. 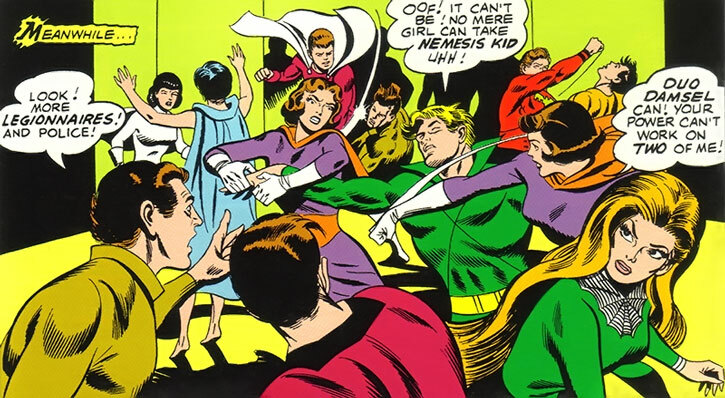 Teaming up with Shrinking Violet, Triplicate Girl took down Invisible Kid, Brainiac 5, and Cosmic Boy before Azura repented and freed the girls from her control. 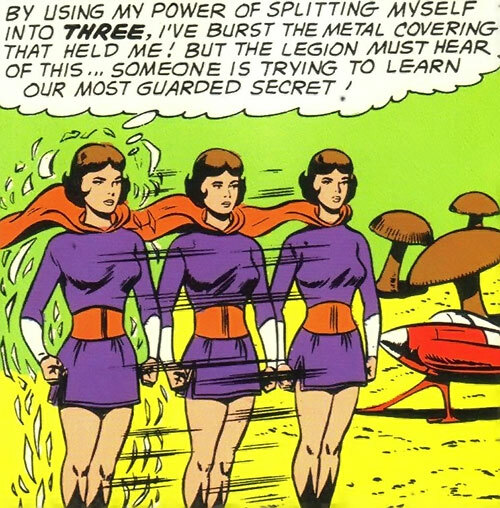 On at least one occasion, Triplicate Girl guarded Earth and the Legion Clubhouse on her own. This was while Mon-El led about half the team on an off-world mission, and Superboy led another 10 Legionnaires into the past to investigate evidence of a pre-historic war between Krypton and Atlantis. A few years into her Legion career, disaster struck when Triplicate Girl faced Computo the Conqueror. Computo was an insane A.I. who proved to be one of the Legion’s most formidable foes. It kidnapped numerous scientists, threw Metropolis into chaos, and at one point had the entire LSH on the run. During one of the Legion’s clashes with Computo, the murderous machine snatched up a fleeing Luornu and disintegrated her, killing her instantly. The Legionnaires who escaped held a funeral for Luornu. They built a device to gather her inert particles and launched them toward Shanghalla, the ancient cemetery asteroid for heroes from around the galaxy. After the funeral, Luornu’s remaining two bodies linked up with the Legion again, revealing that &frac23; of her had survived. Luornu bravely declared her intention to continue as a Legionnaire. She changed her codename to Duo Damsel to reflect the new limit to her power. She stood beside the other Legionnaires as they eventually defeated Computo, though it was a near thing. 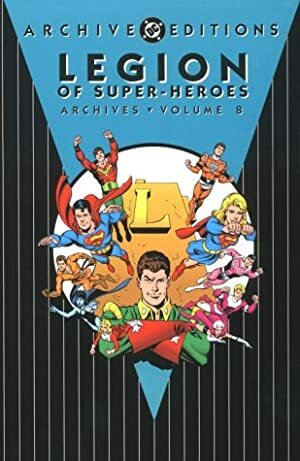 Given the Legion’s recent string of casualties (losing one of Luornu’s bodies, Lightning Lad losing an arm, Bouncing Boy losing his power, and Star Boy being expelled for breaking the Legion Code when he killed a villain in self-defense), it’s not surprising that the Legionnaires nearly fell prey to a group of con-artists. These were styling themselves after the legendary Luck Lords of Ventura. 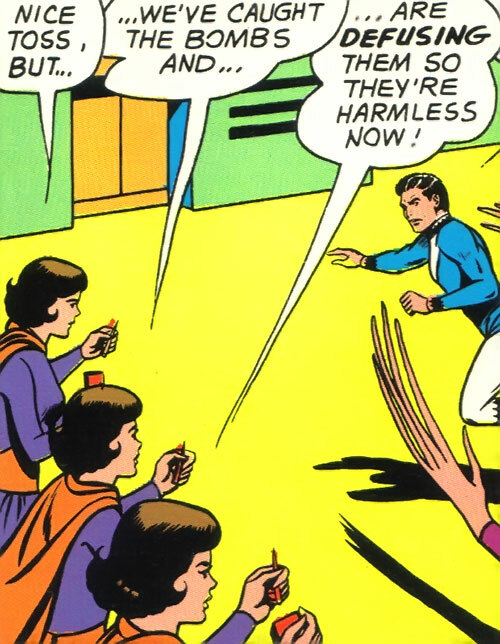 Using subtle hypnotic devices, the faux-Luck Lords convinced several Legionnaires that they were “jinxed”. Duo Damsel herself briefly became convinced that she’d been hurt by Computo because she’d violated an old Carggite superstition by triplicating 3 times in one day. But with help from the Legion of Super-Pets, the Luck Lords were exposed as frauds. Luornu and the others regained their self-confidence. As Duo Damsel, Luornu proved that she was still a worthy Legionnaire. Her biggest contributions were in the area of stealth and deception. She used one body to keep an opponent’s attention while her other body acted in secret. In this way, she and Saturn Girl were responsible for the mass jailbreak of the Legionnaires and other heroes after they had been captured by the villain Nardo. One body publicly behaved as a model prisoner for Nardo’s android guards while the other slipped away and freed the other Legionnaires. Duo Damsel went with most of the Legion on an unchronicled mission to dimension QK-51, a mission which had them off-world when the Sun-Eater attacked and Ferro Lad was killed. On a later case, Universo secretly replaced the President of Earth and was controlling most of the population via hypnotic chemicals. Duo Damsel and other Legionnaires were briefly imprisoned but were freed by their teammates. Luornu then helped a small group of Legionnaires infiltrate the Presidential Palace to try and figure out how people were being controlled. Disguised as a courier, she gained entrance to the building. Then, while unobserved, she once again provided her own alibi. One self exited openly while the other hid until the coast was clear, then broke into the presidential safe to search its files. This unfortunately turned up no clear evidence, but the LSH was eventually able to defeat Universo with the aid of Rond Vidar. In her next major case, Duo Damsel and the other female Legionnaires were once again brainwashed into attacking their male teammates, this time by Ambassador Thora of Taltar. Thora not only controlled the Super-Heroines but fantastically augmented their powers. Temporarily, Duo Damsel became able to duplicate an army of herself, materializing a hundred duplicates at a time. The effect faded when Thora was defeated by Supergirl. 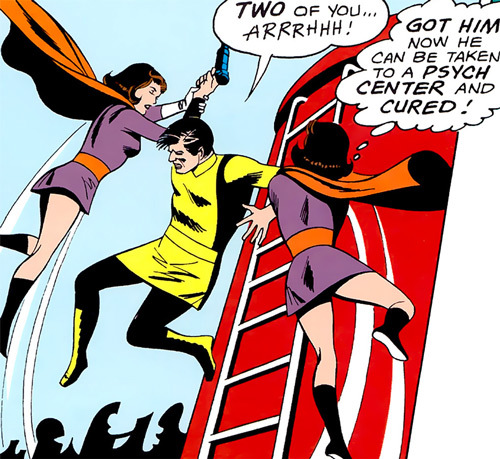 In an effort to escape from the sorceror Mordru, Duo Damsel set the time-cube’s controls to send herself, Superboy, Mon-El, and Shadow Lass into the past to hide in 20th century Smallville. Mordru followed, forcing the heroes to adopt secret identities. Duo Damsel posed as Marie Elkins, a relative of Police Chief Parker’s wife. Without revealing her secret identity, “Marie” prevented two trucks from colliding in a traffic accident. Then, during the battle with Mordru and his army, Duo Damsel split and disguised one of her selves as Shadow Lass. This way the real Shadow Lass could later help take the sorcerer by surprise. The time spent in Smallville impacted her, though. It forced her to confront her crush on Superboy and to acknowledge to herself that it would never go anywhere. Ironically, as she began the painful process of moving on, Superboy found himself attracted to Duo Damsel. 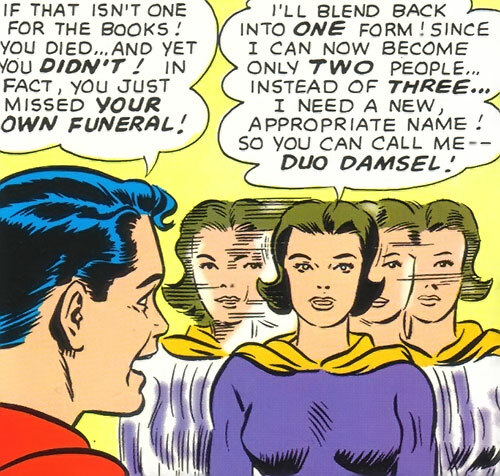 Duo Damsel was one of the heroes fatally poisoned during Brainiac 5’s birthday party. She watched Superboy, who was likewise poisoned, spend his last hours performing terrific feats. She wished she could do the same, but found herself thinking that the Legion shouldn’t bother keeping her around, that her powers weren’t much use compared to her teammates. Duo Damsel decided to spend her last hours with her parents, concealing from them the fact she was dying as she didn’t want her father to blame the Legion for her death. 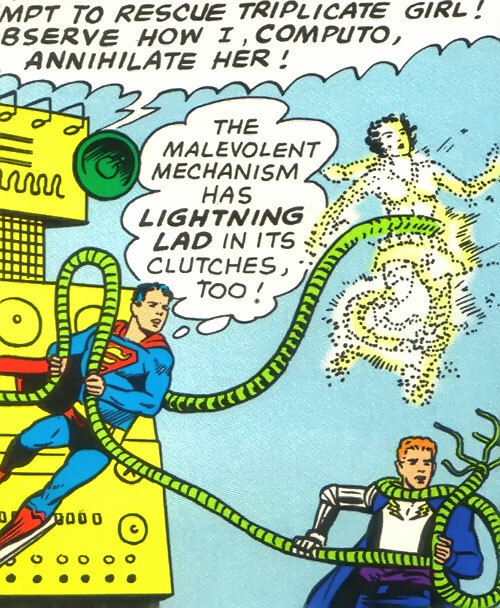 She and the other Legionnaires were eventually cured by use of the Miracle Machine, but this second brush with death (and likely her grief over Superboy) had shaken Duo Damsel’s self-confidence. On her next mission, Duo Damsel and several other Legionnaires were lost in space. Superboy was seemingly killed before her eyes and the others were marooned in an unknown corner of the galaxy. Bouncing Boy comforted and encouraged Luornu, revealing his attraction to her, and she seemed receptive to him. After the Legionnaires found their way home, the two began dating. Bouncing Boy helped Luornu again when one of her bodies was sent to deliver a package to the planet Ikros. While there, “Luornu II” met the resident super-hero, Nam’lor, who fell in love with her. Nam’lor dubbed her “Lelith”, meaning beautiful in his language. The hyper-aura which gave Nam’lor powers had a strange affect on “Lelith”, making her fall in love with Nam’lor but also turning her evil. Nam’lor and “Lelith” got engaged, but she convinced her fiancé to return to Earth with her and help her commit crimes. When “Luornu I” discovered this, Bouncing Boy helped her confront the two. Lelith tried to get Nam’lor to kill Bouncing Boy, but even for love of her, he wouldn’t go that far. Grieving, he refused, and left so that the effects of his hyper-aura would wear off and she would return to normal. Duo Damsel continued her Legion career and her relationship with Bouncing Boy. Duo Damsel is a fit and attractive young woman with medium length brown hair, parted in the center and curling outward above her shoulders. 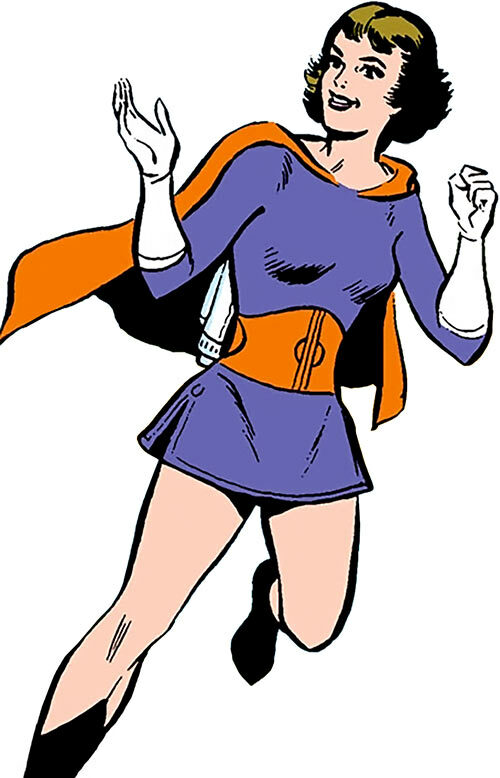 Her costume is a purple blouse and mini-dress with a wide orange belt and an orange half-cape that falls just short of her knees. She wears long white gloves (originally just white wristbands) and black knee high boots. Luornu is resourceful, active, athletic, and outgoing. She enjoys simple and even old-fashioned pursuits: games, sports, writing, sewing, decorating, fashion. Her hobbies are eclectic, and she’s displayed interest in archaeology, geology, journalism, and fencing, among other things. Lu loves her parents. They moved to Earth and live in a suburban Metropolis home. She is dating Bouncing Boy. This is after a long period of mooning over Superboy (and possibly Invisible Kid before that) before finally admitting that there was no future there. In the meantime, Bouncing Boy has begun to win her heart with his good humor and unrelenting support. He also seems to be the only Legionnaire really sensitive to the long-term trauma to Luornu caused by the murder of one of her bodies. Lu is very stoic and doesn’t much speak of it, but it has clearly had an effect. Most notably, she sometimes doubts herself and her worthiness for Legion membership, this despite her normal confidence and competence. 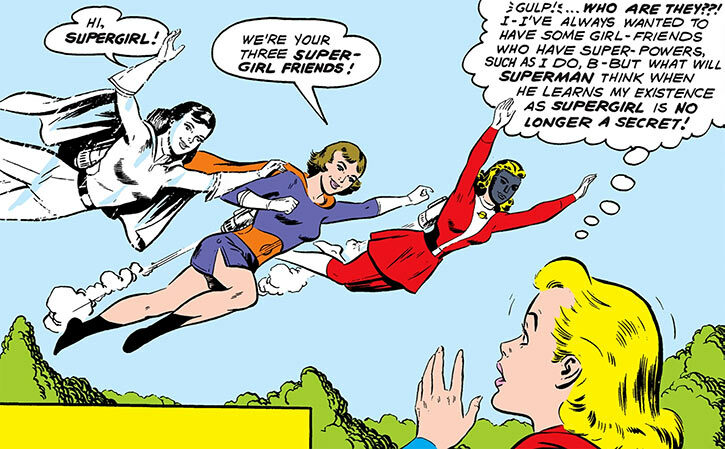 Her other close friendships in the Legion include her best friend Phantom Girl, along with Saturn Girl and Light Lass. She’s friends with Matter-Eater Lad and continues to harbor a deep admiration for Superboy. 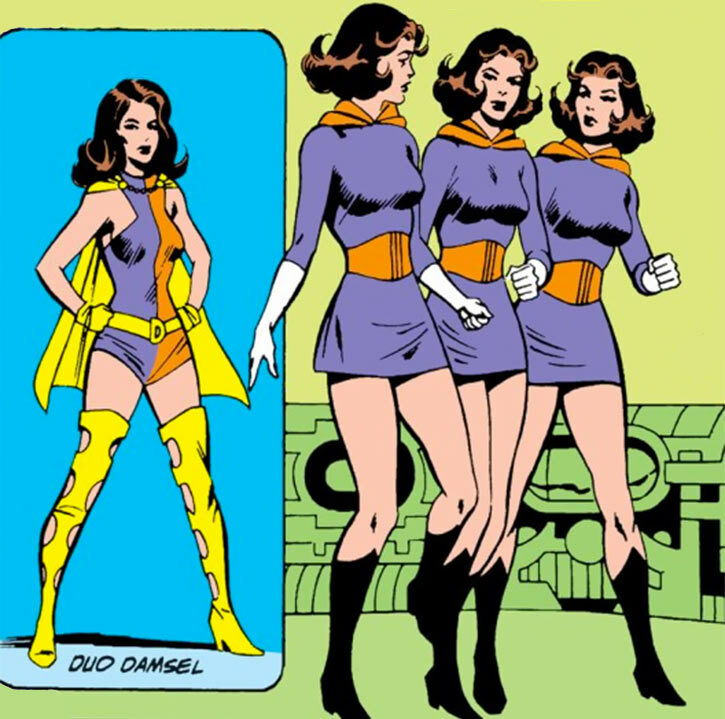 This writeup focuses on Duo Damsel (aka Triplicate Girl) during the Silver Age of Comics, the late 50s and the 1960s. 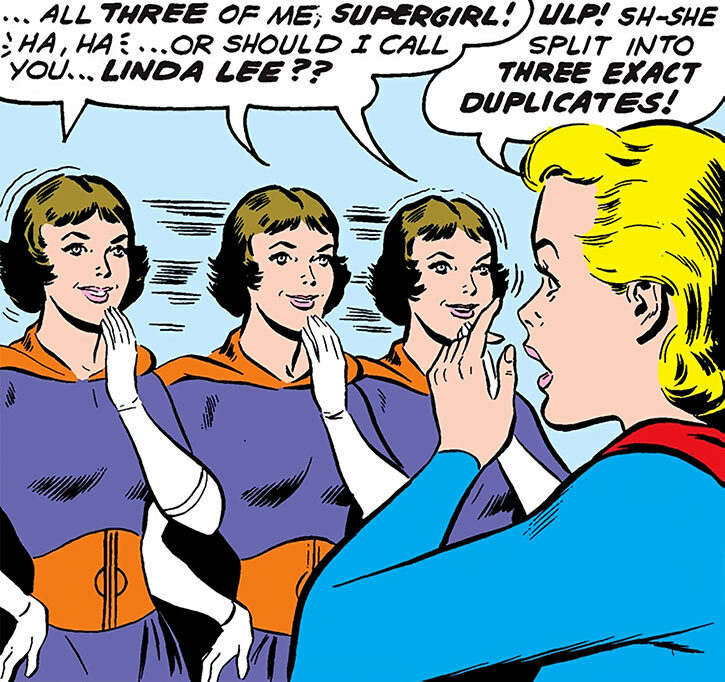 For a later version based on her 1970s and 1980s appearances, see the forthcoming Duo Damsel (Classic) writeup, which may be combined with the post-Infinite Crisis version, where she’s named Duplicate Damsel or Duplicate Girl. Another variant, already on www.writeups.org, is Danielle Mendus’s writeup of the post-Zero Hour (aka Earth-247) Triad. Eventually this will be rounded out with a profile for Luornu Durgo Taine (aka Duo Damsel, Five Year Gap). This is one reason I don’t like reboots: lots of extra work! Originally, as Triplicate Girl, Duo Damsel possessed 2 APs of Split. After Computo killed one of her bodies, that was reduced to 1 AP of Split. No AP Loss per Split (+3 FC, x2 Base Cost). Split Death causes loss of an AP of Power, but no reduction of Attributes or Skills (+1 FC). No Original Body (+1 FC). Each of Triplicate Girl’s bodies is considered equal. Unlike a normal Carggite, the death of one body does not automatically mean the death of all bodies. Her bodies must be within a few feet of each other, perhaps touching, to reintegrate. Acrobatics (Dodging) is a Powered Skill (-1), Derived from Split (-1), and only usable when Splitting or reintegrating (-1). She’ll Split to let an attack go in-between two bodies, or reintegrate her bodies to move one of her selves out of the way of an attack. Confined HQ (her parents’ home in suburban Metropolis), Credentials (Science Police/LSH, Medium), Local Hero (Legionnaire), Schtick (Fighting Array — when her split selves work together in melee combat, they get an extra Column Shift of Team Attack Bonus). Initially, she wore a Legion Flying Belt when going on missions. This was later replaced with an early model LEGION FLIGHT RING, the most modern flying device used during the time period covered by this writeup. See the Legion Equipment writeup for details. I’ve given Duo Damsel the benefit of the doubt in some areas, notably in her DEX and her fighting and thieving skills. Considering the level of opposition the Legion normally faces, I figured she could use the help. She doesn’t see a lot of action in the Silver Age, and her fighting skills are based almost as much on her Bronze Age performance as on the period covered by this writeup. There is foundation for all of it: she practices fencing, plays athletic sports, handles firearms competently, is able to punch out thugs (and Nemesis Kid), etc. The thief Subskills are based on her semi-frequent participation in Legion Espionage missions where she had to be stealthy and at least one instance of successful safecracking. Still, a more conservative approach would drop her DEX and Weaponry to 04 and her Martial Artist and Thief Skills to 03. As for Fighting Array, we don’t see Luornu in action quite enough for this to be definitive. But it’s implied by the nature of her power (multiple selves with identical training and thought processes able to coordinate with uncanny accuracy) and her selves’ coordinated attacks on Nemesis Kid. Later versions of Luornu explicitly have “Tri-jitsu” training, which basically equates to Martial Artist + Fighting Array. While the Tri-Jitsu name isn’t used during the Silver Age, it’s not a stretch to argue from her performance in Silver Age stories that she already has those skills. Source of Character: DCU (Adventure Comics, Action Comics, Superboy). 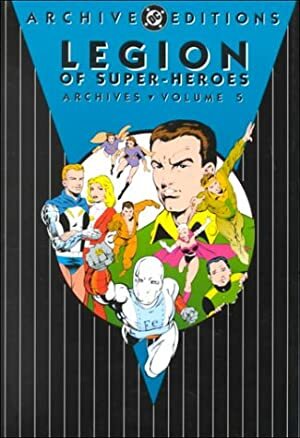 Helper(s): Eric Langendorff, Gareth Lewis, Darci, Mayfair’s Legion Sourcebook vol.1; the 2995 Legion of Super-Heroes Sourcebook by Mayfair; and the now-defunct Silver Age Legion site, still accessible via the Wayback Machine. Writeup complete the 5th of June, 2014.